Sometimes peonies are not blooming nor the second, nor the third year after planting, despite the fact that externally, the plant looks quite healthy. Causes can be many. The landing site is not the best. It can be dark, dry or waterlogged. Strong shading for a few hours a day, leads to the fact that the peony will not bloom or bloom a little. If the Bush is planted near the trees. The trunk of the tree peony will receive less moisture and nutrition. Peony planted recently or Zelenka little. You need to wait, because in the first year peony develops slowly. In the first year in small delenka going nutrients content. If Zelenka too large, the root system size and number of kidney is not proportional. Peonies planted too close to the soil surface or too deep. From the top of the buds to the surface of the soil should be 4-6 see When the buds rise above the soil surface, they suffer from frost, heat, dry air. In the landing from lack of air, from waterlogged. Transplanting and division is often. We need Bush to leave alone for 4-5 years. Plants full of nitrogen fertilizers. They are growing but not blooming. Peonies are starving. The buds appear, but they are not disclosed. 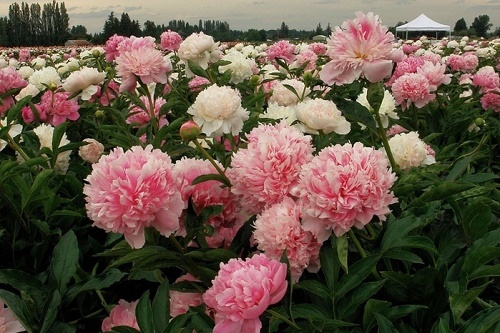 Peonies should be fed after flowering, when the formation of the kidneys resume which are tied at the peonies a couple of years before flowering. Dry weather and dry soil in the period of budding. In this case, watering is necessary, it should be rare, but the soil must be wet to the depth of the roots. Heavy rains during the ripening of the buds. The buds are saturated with water, darken and bloom. Before cut the leaves of the plant. The aboveground part of a peony cut required in late autumn. Frequent cutting of flowers. You must not cut more than a third of the stems, leaving the lower leaves. The roots of peony gnaw moles, rats, mice. Weaken the peony diseases: leaf curl, pulling the crown. To obtain the planting material must have a four-year Bush cut the rhizome 3-5 cm below the depth of the main mass. The severed portion is removed from the soil, divided into 3-8 pieces, and drop them off for growing.